This morning as I was coming up the hill and over the dam on my 9-mile pace run I did what I do on most mornings training for a race – which is work on my visualization. Some refer to this as guided imagery, mental rehearsal or self-hypnosis. Now I don’t know about all that. But what I do know is that imagining how it will feel to take on a particular part of a course, push through mile 20 or the feeling of coming through the finishing chute at a marthon helps me focus during my training runs. I’m not alone as visualization is becoming a much more main-stream training strategy. The belief is that an athlete through visualization is able to create a mental image or intention of what they want to happen or feel. By imaging a scene, complete with images of a previous best performance or a future desired outcome the athlete, or runner in my case, is told to “step into” that feeling. These “visualizations” can include any of the senses. They can be truly visual including images and pictures. They can be more or less kinesthetic – how your body actually feels. Or they can be auditory – such as the sound of feet pounding on the pavement, or the crowd lining the last .20 miles of a marathon course. Through this mental “rehearsal” if you will, your mind and your body become trained to actually perform the skill imagined. Until this morning most of my images have been focused primarily on the Boston Marathon. How will I handle the downhill start to the race? What will the crowds be like? At Wellesley College is the scream tunnel really that loud? How tough will the Newton Hills really be? How about Heartbreak Hill, will it be that unforgiving? How will I feel over the last mile traveling onto Boylston Street packed three and four people deep? Will the 500,000 spectators on the course or the unpredictable New England weather play a factor? Frankly, I’ve had a lot to think about. 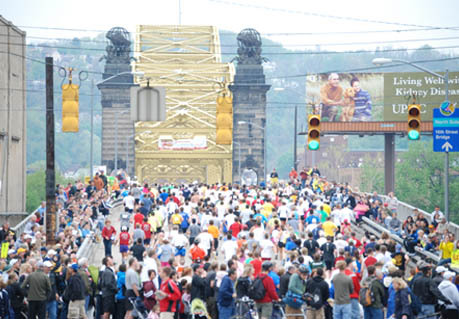 But today I instead started focusing on the race just 13 days later – the Pittsburgh Marathon. I had a great experience last year at Pittsburgh. Everything from having family and friends at the race, the course itself, the volunteers and even the weather was just about perfect. I was able to train hard, come into the race 100% healthy and execute my race plan virtually to perfection. Even the featured hill of the course at Forbes was one which I was completely prepared for at mile 13. I was able to take on that hill with energy to spare and only give back a little over 20 seconds to my goal time. 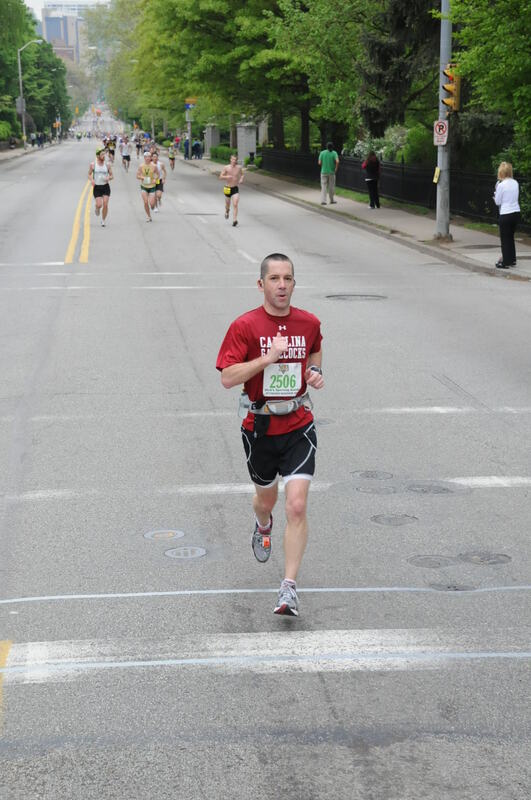 I was able to run split after split at the intended pace and beat my Boston Qualifying time by more than 2 full minutes. Looking back it was almost the perfect race. Even post race breakfast at the Dor-Stop was awesome. So what will this year bring at Pittsburgh? To be completely honest I’m much more worried about the second of the two marathons than I have been letting on. Barring injury or something unforeseen, I think I am going to race well at Boston. I have been training hard, working on my hill running both up and down. I have been studying the course, talking with experienced Boston Marathon finishers and downloading as much information about “the Boston” experience as my brain can hold. But Pittsburgh 13 days later is going to be a very different story. How will my legs feel on the morning of May 2nd? 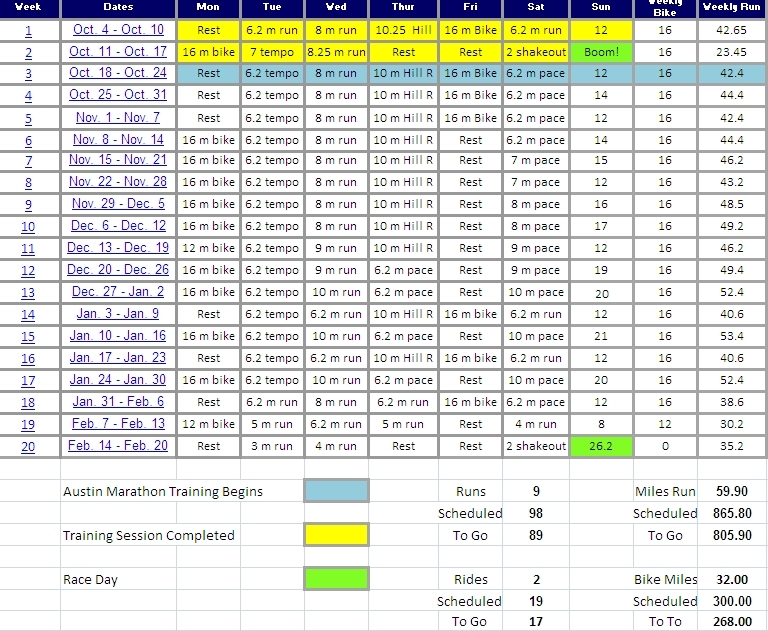 Will I have been able to rest enough and recover enough for a second 26.2 miles less than two weeks after Boston? Experts say that it takes 4 full weeks to completely recover from racing the 26 mile 385 yard distance – are they right? Will Forbes Hill be as forgiving as it was in 2009 or will it trip me up this year? And of course the big question is, what about my commitment to Dom? One thing I know is that the 26.2 mile distance is to be respected. It has come back to bite far more accomplished marathoners than me. Last year going into the Pittsburgh Marathon I knew that if I didn’t achieve my Boston time so what? I would still have a family that loved me greet me at the finish and tell me they were proud of me regardless. I could chase Boston another day. But this year it’s not the same. We’re out there in 2010. We’ve made commitments and promises that are too important not to see through. 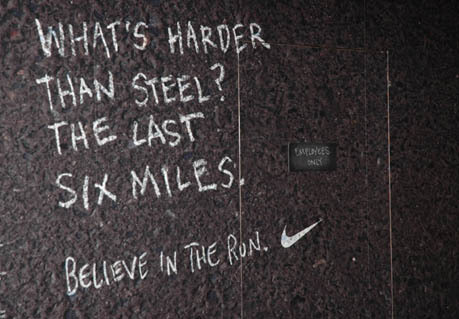 So today’s training run was dedicated to that second marathon in the Steel City. I visualized a course that I know quite well after last year’s race and practiced keeping my form smooth, my arms pumping, my posture tall and my stride long. I took on that hill leading up over Brushy Creek Dam with great purpose. I have run that hill more than 500 times in the past, but today was special. Today it was personal. I caught myself at the top with a smile on my face as I kicked over the crest and onto the flat section that makes a sharp right onto the dam itself. I practiced what running coaches preach about not training your body to relax at the top of a hill by letting up at the top, but to push three strides through it and “bound” onto the flat – to keep pushing. It felt great. I felt great. It provided me with another positive image to draw on when the streets of Pittsburgh start fighting back in May. It’s going to be a 3 ½ hour battle of wills May 2nd of that I am certain. If there is one thing I know about Pittsburgh – just like my boy Dom – that city has a lot of fight in it. Frankly, I wouldn’t want it any other way.